After high school in LA and hippie days in Santa Barbara, Paul McNamara migrated to Eugene in 1974 and found a job at Sawyer's Machine Works. 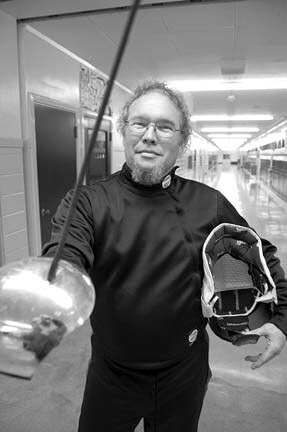 Inspired by seeing members of the Society for Creative Anachronism, who fought with rattan bats for swords, he took a fencing class in '76 from UO coach Paul Dart. "I found I was a natural," says McNamara, who became Dart's assistant after six months and founded the Eugene Fencers Club later the same year. Since 1979, he has worked at various jobs for the City of Eugene, then taught fencing in the evening in the same small gym at Roosevelt Middle School. "I've taught 3 to 5 thousand sudents," he estimates. "Some have won full scholarships to Notre Dame and Duke." At age 57, McNamara competes in the veterans division in six to 10 tournaments a year. He teaches twice a week at Roosevelt, once at North Eugene, plus two afternoon classes for home-schoolers. Students range in age from six to 50. "I teach kids how to fight," he says, "to react and not be deer in the headlights." Learn more at eugenefencersclub.org.